As podcasting has evolved, a need for impeccable communication quality and production convenience has been established. Proven in satisfying these criteria, the all-in-one G-Track USB condenser microphone is a podcaster's dream come true. Given a simple USB connection straight into your Mac or PC computer, it provides your podcasts with unparalleled performance in audio recording, as well as extreme ease of data mixing, transfer and broadcast. Use the included desktop stand to provide your broadcast studio with a more professional aesthetic. With G-Track affordable for all, the voices of millions of web journalists are empowered to establish a discernable identity in the congested world of podcasting. With computer-based technology becoming a vital part of education, G-Track is a must among students, professors and administrators. In addition to podcasting, G-Track can elevate the educational values of Skype, VoIP and screen capture-type software programs like Camtasia Studio and NaturallySpeaking. These applications, all of which can be used to teach, study, and/or catalogue academic materials in-person or from afar, are dependent upon the superior degree of audio capture delivered by G-Track. So, whether you're teaching an online course, reviewing a past lecture or studying for a big exam, G-Track helps to make education a more accessible and interactive experience. G-Track provides answers for those business professionals in need of revitalizing their corporate communications. Regardless of the specific application (web design, multimedia presentations, company meetings, corporate events, etc. ), G-Track's features allow for the easy, cost-effective recording of studio-quality audio clips to be used to invoke interest among internal stakeholders or event attendees. 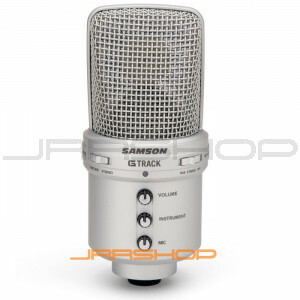 Samson offers a collection of pro-level accessories (all sold separately) that can be used to further enhance the recording experience of the G-Track USB condenser microphone, including the PS01 microphone pop filter and the SP04 optical shockmount. The PS01's nylon mesh screen will reduce vocal popping and sibilance from affecting the performance of your G-Track. It also comes equipped with a universal mic stand mounting bracket and a flexible metal gooseneck for convenient placement. Lastly, the SP04 provides G-Track with a reliable shockmount system to absorb unwanted vibrations and disturbances.